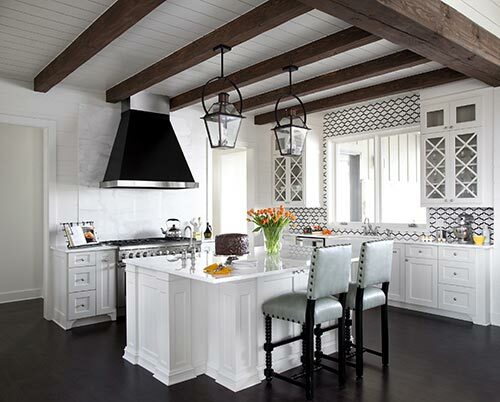 Trends are ever-changing and often short-lived, but the styles they produce can be timeless (white kitchens anyone!). Get your creative mojo going with these designs so that you can recharge the heart of your home. In 2019 it’s all about achieving the most functional space for your needs. We all want a kitchen that looks fabulous, but functionality is the key to any great cooking space. The Scandinavian and traditional English style kitchens put the focus on function and give you the beautiful space you desire. You’ll have a simple yet understated and thoughtful design. Introduced in Denmark and extending to other Scandinavian countries like Norway, Sweden and Finland, the style is all about the feel, not the look, of your kitchen. With the Scandinavian or hygge (pronounced "hoo-gah") design, you want to create a space that’s homey, comforting and simple. It’s all about achieving clean lines with spacious countertops that are durable and practical for all uses. Keeping the color palette neutral is essential. Think light grays, whites and creams or taupe—but you can always add some pops of color in your accent pieces. Along the lines of that simplistic feel, the traditional English kitchen is about creating a space that’s more concerned about function over aesthetics. It’s plain and simple. Keep your color choices natural and uniform throughout. The materials you choose will be practical and durable, stone countertops like granite or marble will help achieve that functionality. Brass and iron finishes round off the sturdy and sustainable space. 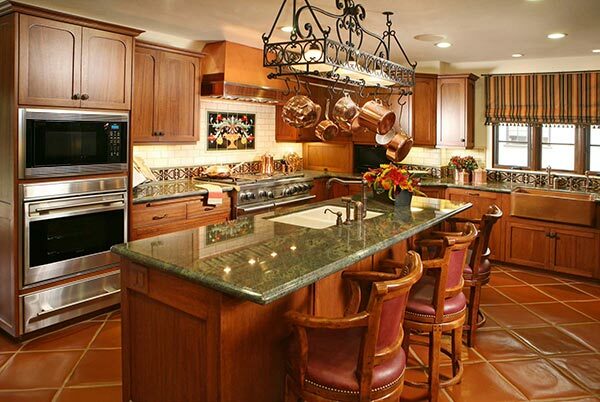 An island has become common place in the kitchen but it’s a staple of the traditional English kitchen. It’s the workhorse of the room, a heavily utilized piece of equipment that maximizes functionality. One thing that seems to always be in fashion is mixing traditional and modern elements. 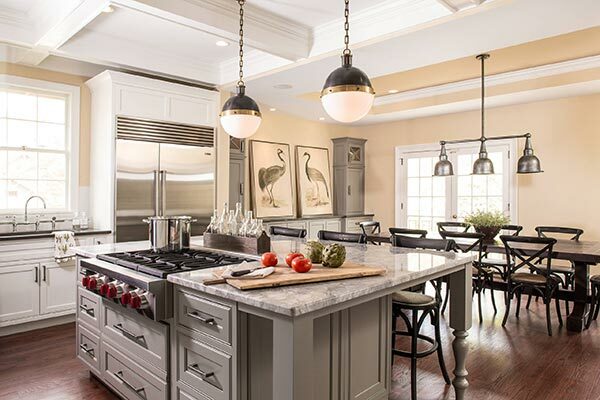 You may like the look and feel of a traditional English kitchen but by adding flat panel doors, more elegant trim, sleek appliances, and metallic finishes, you’ll incorporate more modern touches. 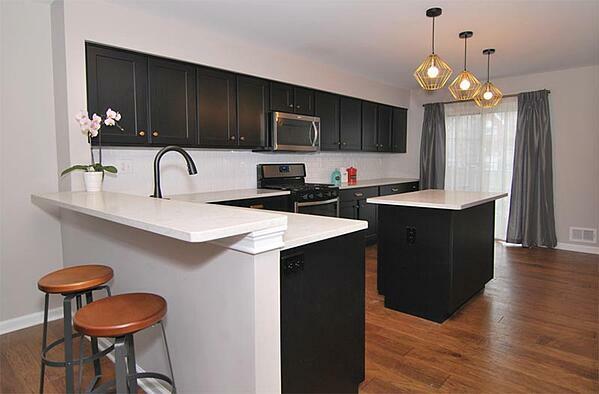 Or, if you like the minimalism of the Scandinavian style kitchen but you want a little more flare, you might add some intricate trims and moldings or metal accents and some funky lighting fixtures to really build up the area. For those looking for a more contemporary style, you’ll want to consider updating your color scheme. Choose some different shades and hues for your cabinets and accent pieces to brighten up the space. White may be timeless but this year other colors take the spotlight. 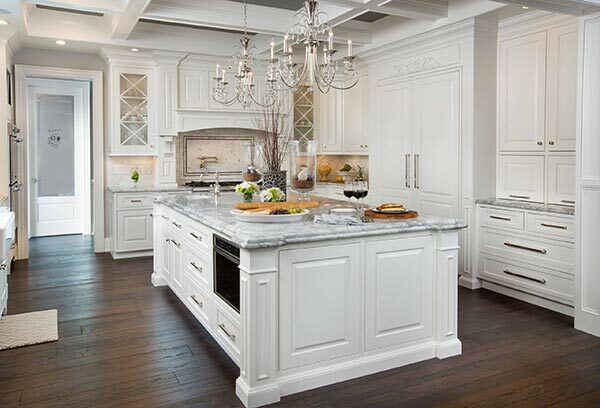 Neutrals are always a good choice when it comes to kitchen cabinetry (think greys, grieges and whites). But don’t just limit yourself to one color, get creative with two-tone combinations like colonial blue on top and satin white on the bottom—or vice versa. Blue is a tried and true color choice for any kitchen. A cadet blue offers subtle grey hints to keep the color muted but with aesthetically pleasing results. Matte black is in right now—we told you—white is so over (well, not entirely, it’s timeless!). 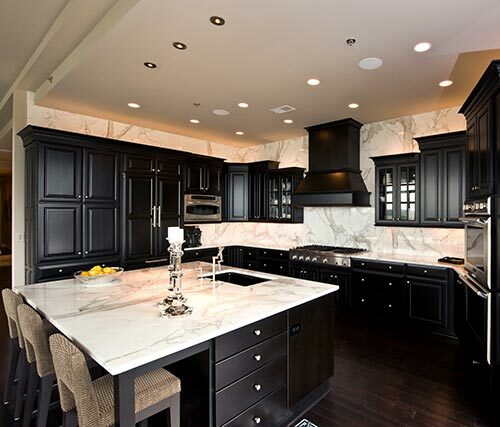 Black cabinets are no stranger to the kitchen—think the tuxedo look. 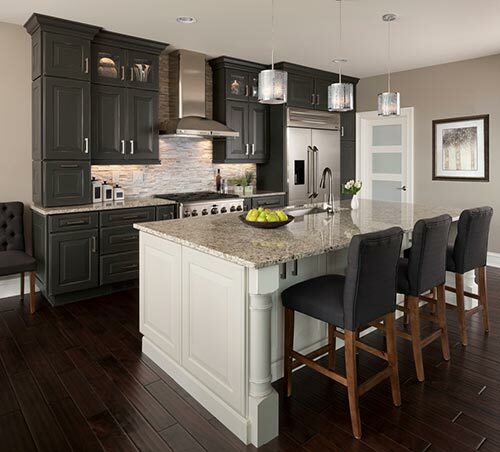 If you’re not willing to take the plunge into all-black cabinetry, mix and match with lighter more neutral colors for balance. 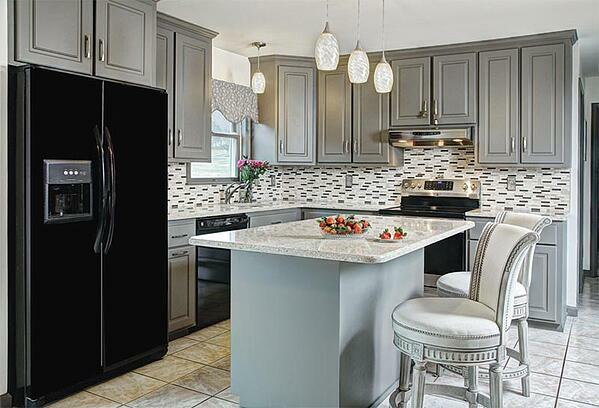 You can even pair matte cabinets with matte appliances. The sleek finish looks great and is easy to clean too! Hunter green is especially popular this year. And that’s a good thing, green is often associated with feelings of relaxation so, it’s no surprise that you’d want to include this color in the kitchen. 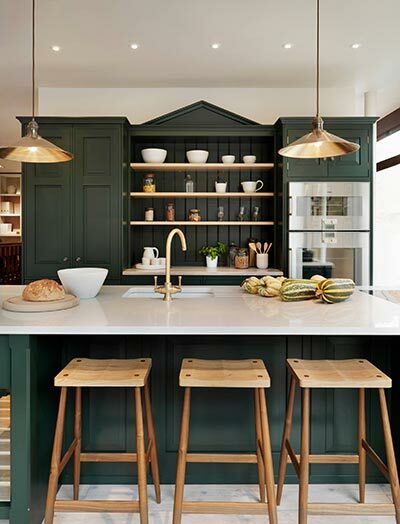 But again, if you’re hesitant to take the plunge and go all-green with your cabinetry you can either mix and match with another color or use green in your accent pieces (more on that coming up). Either way, you’ll want to incorporate this color into your design for a trendy, stylish kitchen. 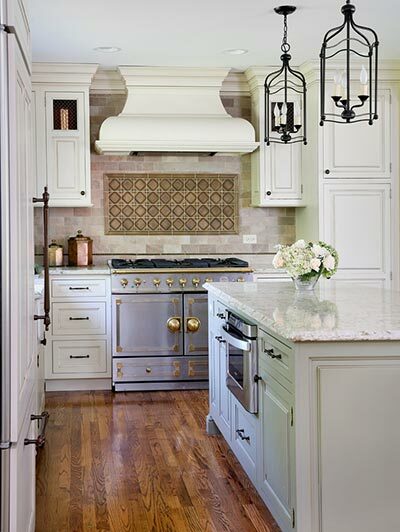 Creating color contrasts can break up a monotone kitchen. You have many options to do this other than the through cabinet colors. By blending dark floors with lighter cabinet and countertop colors you can achieve a stunning look. 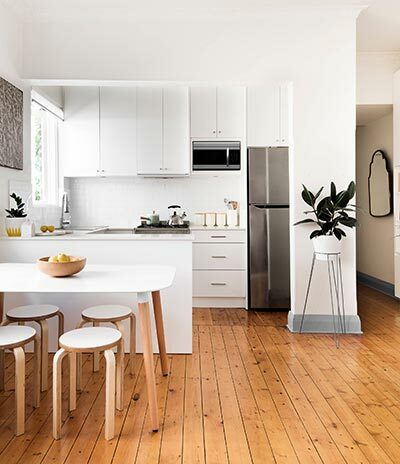 Coupling wood grains with whites helps you attain the Scandinavian design—even if you’re not into that style, the mix and match can work in a contemporary or modern kitchen. There are several opportunities to add some spice and personality to your design as well. Accent pieces like, lighting, backsplashes, furniture and finishes can provide depth and texture. These little touches really bring a room together for a welcoming and inviting space. Don’t forget about your lighting options. 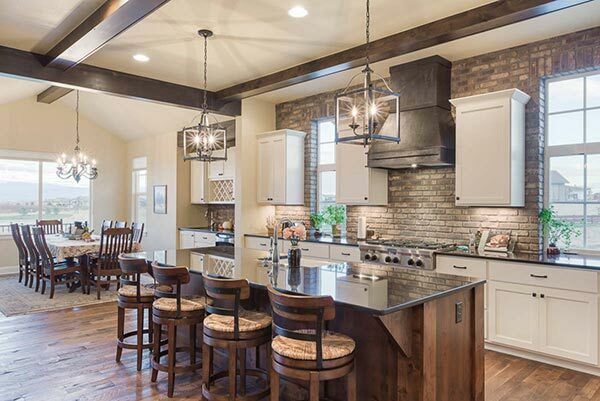 Pendant lighting is a way to denote different areas of an open floor-plan. Lighting provides warmth for a room and pendants add some luxury and texture to the space in the process. You can really make a statement here so don’t be afraid to make daring choices. It’s time to get creative with the sitting area in your kitchen. A table with separate chairs has been a gathering place for years. With the kitchen island being a popular design choice, it’s changed the way we plan our kitchens. A larger island offers not only space to work but also a replacement for the table in some cases. This year give a little thought to the seating options in the most used room in your home. Bring your family together with banquette style seating. This customized, unique feature can increase the value of your home and provide the gathering place for stories yet to be told. If you’ve got an island or you’re going to incorporate one in your design, then add a little pizzazz with some statement stools. You don’t have to be conservative with your seats. If they'll be the main seating option in the kitchen (or even if they aren’t) you want something comfy and stylish. Your choices run the gamut from simple and modest to glamorous and refined. If you’re looking for clean, sleek designs, then you’ll want to think about concealed/integrated storage. Consider deep drawers for a place to hide all your pots and pans. If you’re including an island in your design, then you want to make the best use of your space. 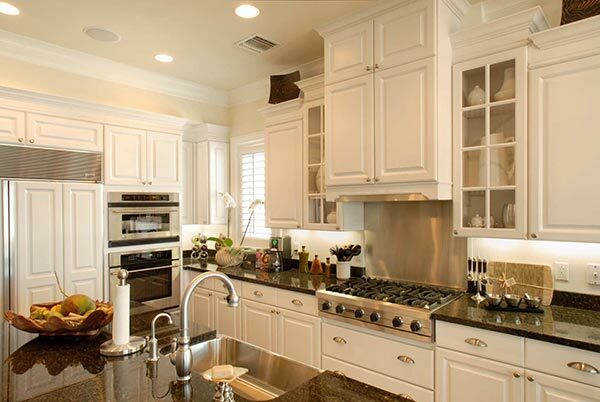 A well-designed island can increase your functionality in the kitchen with storage and a viable workspace. "Another concealed storage option is to choose a kitchen table with built-in shelving or a wine rack in the base", says Erin from American Freight Furniture and Mattress. But concealing doesn’t have to stop with storage. Unsightly hood vents are a thing of the past. For a seamless, artful look think about hiding them as part of your design. And while you’re at it, if you want cleaner countertops you might want to place appliances like your microwave under the counter and out of sight. Even the smallest details will show in your well-thought out design plans. Pewter, gunmetal and copper hardware finishes or even leather drawer pulls are a popular way to add character and intricate details to the most used room in your house. Going for the black cabinet design? Try pairing it with gold finishes for a contrast in color and a striking look. Don’t be afraid to mix metals either, the combinations create unique visuals. Creating texture can be as easy as utilizing raw materials like wood or exposed brick. Raw materials are found in European style kitchens including the Scandinavian design. But if you’re not into the minimalist trend you can still achieve a rustic feel by adding these elements to your room. 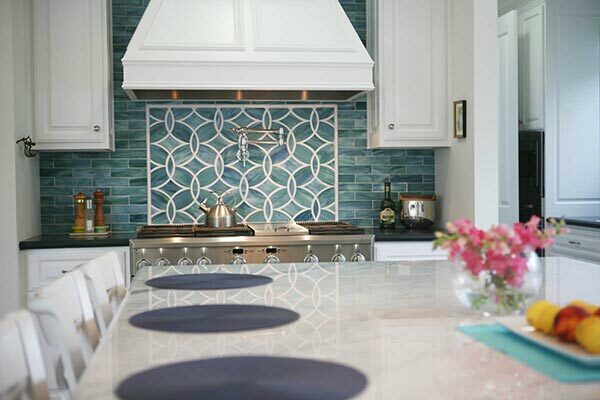 If you opt to include a backsplash, draw the eyes to this focal point by bringing it higher up the wall. Don’t be afraid to take it all the way to the ceiling and think about colorful tiles or eye-catching patterns. Technology advances arise just as fast as design trends emerge. Incorporate tech in your kitchen design for a state-of-the-art, futuristic experience. From remote control lighting and touch faucets to smart screen display refrigerators and Wi-Fi capable appliances you have options. The bottom line, it’s your kitchen and you can make it what you want it to be. Digest these designs and when you’re ready to make your kitchen dream a reality, schedule a consultation with Kitchen Magic.